Victoria Harker is hard at work preparing the spin-off of Gannett’s newspaper business. 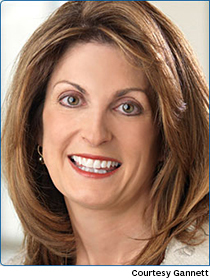 An interview with Victoria Harker, CFO, Gannett. Few sectors are experiencing the kind of turmoil that has engulfed the newspaper industry. With advertising revenue for print continuing to decline, media companies are separating newspapers and magazines from their far more profitable broadcast and digital businesses. Time Warner, for example, recently spun off its magazines and threw in $1.3 billion of debt to boot. Tribune shed its newspapers (including the Chicago Tribune and the Los Angeles Times), saddling the spin-off with $350 million of debt. E.W. Scripps and Journal Communications agreed to merge and keep their television stations while spinning off their newspapers. Now, Gannett is following suit. The Mclean, Va.-based media giant (2013 operating revenues: $5.16 billion) announced in August that it will split in two: a publishing company, including USA Today, 81 local daily newspapers, and their affiliated websites; and a broadcast and digital company, which will keep Gannett’s 46 TV stations and such digital assets as CareerBuilder and Cars.com. The newspaper spin-off will retain the Gannett name and start with a clean, debt-free financial slate, according to CFO Victoria Harker. Harker, 49, is no stranger to business transformation. Before coming to Gannett in July 2012, she was CFO at AES, where she oversaw a restructuring of the power company’s capital structure and financial reporting. Prior to that she was part of the finance team that brought scandal-ridden WorldCom out of bankruptcy as MCI, serving as acting CFO and treasurer of MCI from 2002 to 2006. Shortly after Gannett announced its own transformation, Harker spoke with CFO about the preparation and prospects for the spin-off, which is expected to take place in mid-2015. How involved are you with preparing the spin-off of the publishing unit? Very. We’re already in the midst of our separation work stream. A big component of that is the Form 10, the financial document; it requires a huge amount of work. Besides providing pro forma financials, it also lays out the road map in terms of the spun businesses—what the strategic efforts will look like going forward, what the projections will look like going forward, their management teams, directors, compensation—all of that. Preparing the Form 10 typically takes anywhere from 10 to 18 months, depending on the complexity of the business. A lot of that is the decision-making around those points I just mentioned. But a lot of it is much more mundane things, like creating an inventory of all the leases in the company and which company they’re going to belong to. Some people praise Gannett because it isn’t burdening the newspaper spin-off with debt, as other media companies have done. Others criticize Gannett for not including, say, Cars.com in the spin-off to provide more advertising revenue. How do you respond to these views? Relative to the debt, we felt very strongly that the publishing segment—which has its own digital properties, by the way—needed to have the kind of capital structure that will enable them to be a consolidator in the industry, should that be the strategic decision they make. They have produced a very efficient model for running the newsroom of today and tomorrow. So we didn’t want to saddle them with a lot of debt. We wanted to enable a good revenue stream, a good cost structure, and good cash production, so they can do the kinds of things they need to do to create longevity within that business. Relative to Cars.com, we will have affiliation agreements with the publishing business for five years after the deal closes. In our way of thinking it’s the best of both worlds, in that Cars.com will live in the broadcast and digital company, where it will have the right type of capital structure and investment, while the publishing side will continue to be able to leverage that relationship. You know, we spent a lot of time with investors during the last 10 days, and a number of them asked how they can become an investor on both sides of the house once we spin. So it’s not that everybody wants to go into growth and be in broadcast and digital. We have a number of investors saying, “We’re very interested in publishing, this is an interesting story for the value side of our investment house.” And it’s a dividend-producing entity, which is very attractive to them. What’s your outlook for the two separate companies? Obviously, we wouldn’t do the spin-off if we didn’t feel strongly that both companies were going to be very well positioned going forward. When I came to Gannett two years ago, we weren’t in a position where we had two companies that could stand on their own two feet, either in terms of their revenue and cost structure or in terms of the efficiency with which they could run themselves. The acquisition last year of Belo really filled out the broadcast side of the house, which now has 46 or so television stations. The digital side has a similar growth profile with CareerBuilder and Cars.com. Meanwhile, the publishing side is now much more efficient and cost-effective and producing a lot more cash. We have the local newspapers in 81 markets; many of them also have USA Today content, and that’s hugely appealing to consumers. So it’s a very interesting business model, and it’s the kind of growth opportunity that happens only in a place like Gannett, where you have a national footprint and the kind of capabilities that we have to leverage. You’ve been through business transformations before, at MCI and AES. Are you attracted to change situations? I probably gravitate toward things that aren’t routine. I’m very comfortable at the bottom of the learning curve. Has anyone in particular influenced your career path? I’ve had the benefit of working for a number of folks. I was a divisional finance person from way back, which I loved, because you were really close to operations. But I also worked for Bob Blakely, who was the CFO at MCI during the WorldCom cleanup effort. He was a serial restructuring guy and tremendously successful. Although I only worked with him directly for a few years, I’ve stayed in touch with him since then. He’s a tremendous resource. We’ve seen that more and more CFOs are adding operational chores to their finance duties. What do you think of this trend? It’s helpful in terms of understanding the levers of the business. Becoming more involved with operations, whether directly running them or indirectly, not only gives you a better grounding in the company, but also gives you a bird’s-eye view into what’s possible—in terms of improving operations, getting better cost savings, unleashing revenue opportunities. Without that grounding, it’s very difficult to know the big levers. I understand that when you’re not restructuring companies, you’re participating in other demanding pursuits—triathlons, marathons, long-distance swims. Well, I don’t do all of them at the same time. [Laughs] I’ve always been interested in understanding what is possible—physically, mentally. And so I gravitated toward endurance sports as part of that. Do you see parallels to your work? I think there’s a similar kind of pacing and figuring out the limits of endurance. And there’s certainly the benefit of teams in both. In any one of these sports that I participate in, I have always trained with teams of people. So it’s the level of expectation of yourself as well as the group that carries itself over into business life. I’m training for a 100-mile bike race at the end of September. This summer has not exactly been ideal for saddle time, so I expect it will be slower than usual. But the very fact of being out there, among other people who are doing a similar activity that has nothing to do with the business world, is always very interesting, and it gives you some mind space. I find I’m problem-solving when I’m out there.